What’s better after a long day than a nice warm home-cooked meal? A home-cooked meal that was easy and fun to make! Check out this colorful list of easy-to-use, affordable gadgets that will make it fun and easy to cook and clean up every single meal and maybe even get the kids to help in the kitchen too! 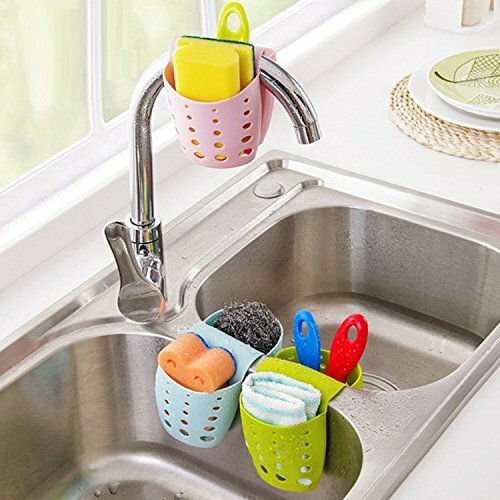 Size: 12.3 x 10.5 x 9cm/ 4.84" x 4.14" x 3.54"
With its adorably colorful design, easy to grip handles, and the rotating stand that will ensure you never lose a single item, this set of kitchen gadgets are irresistible. In addition to the unique German design, it contains the following 9 tools feature a space-efficient storage system: Vegetable & Fruit Peeler, Ice Cream Scoop, Apple Corer, Stainless Steel Pizza Cutter, Stainless Steel Grater, Cheese Slicer, Avocado Slicer, and a multifunction Can and Bottle Opener. Save some drawer space and get a new trendy and useful tool set with exactly what you could ever need! 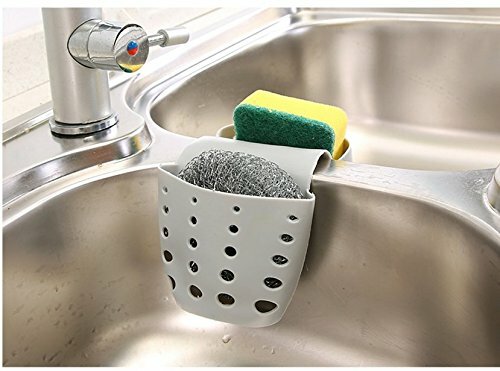 Tired of moldy sponges in the kitchen sink? 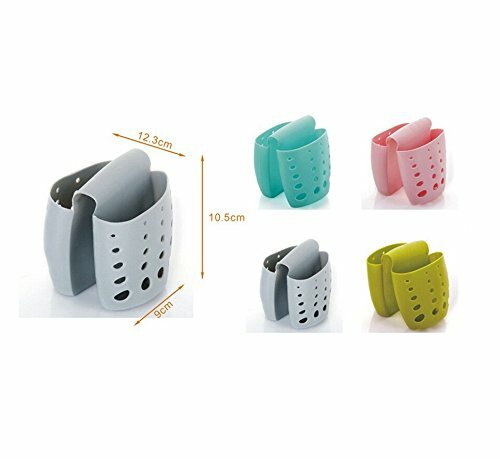 Suction cup holders that never stay in place the way they’re expected to? 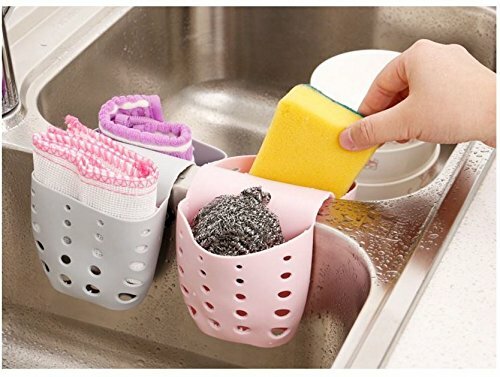 Well, this inexpensive sponge holder is much more sanitary and it has the added perk of being cute to look at, coming in four pastel colors: blue, green, pink, and gray. Made of high quality silicone, and designed to drain through a hole in the bottom. 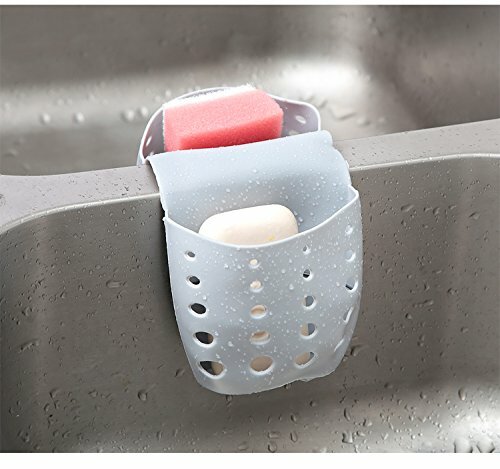 It can be hung on the faucet or between a double sink with no need for securing it in any way. With a large handle and ten stainless steel prongs, you’ll never struggle with slicing produce, eggs, fish, or meat again. Your slices will all come out evenly, making for the very best hors d’oeuvres trays when you entertain! 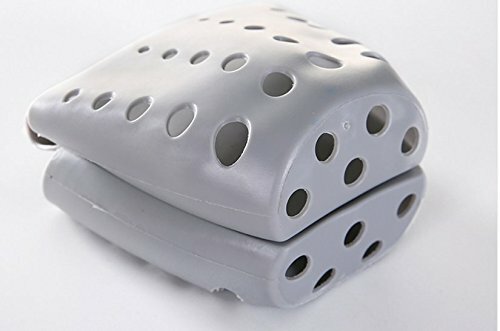 The slicer is dishwasher safe and rust resistant so it is built to last for years to come. There are so many uses for this little lifesaver of a tool. 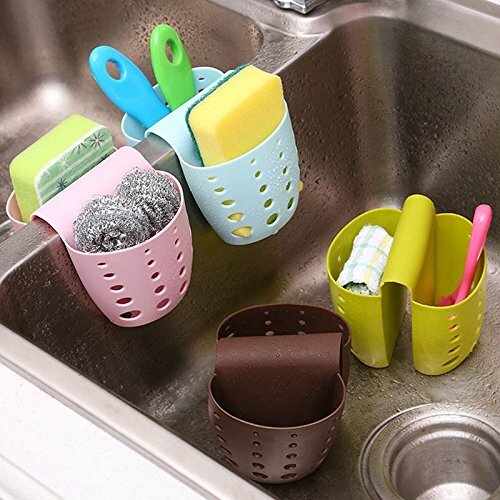 Perfect for scrubbing your vegetables like carrots, mushrooms, and potatoes before cooking and serving. 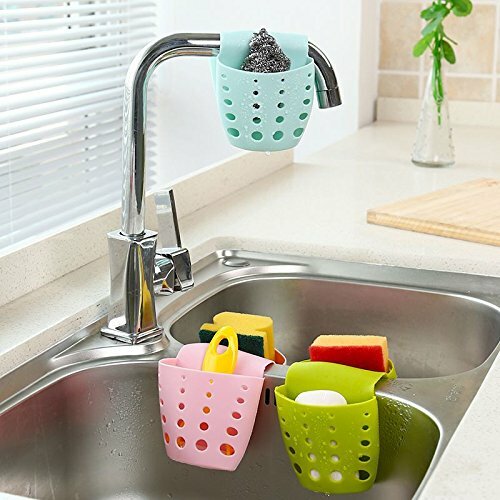 Like many other items on our list, this one comes in multiple colors, but the fun part is that which color you get is a surprise! 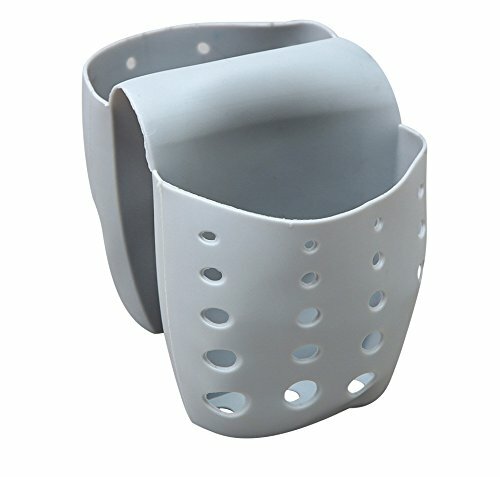 Made of soft heat-safe PVC material, it will protect you from hot item coming from the microwave as well. Finally, it can be used as a jar opener for those stubborn lids that just won’t come off. Is your fridge prone to messes, foul odors, or spills? Do your bookshelves and kitchen cupboards attract too much dust? These antibacterial and waterproof mats should be the perfect solution! Again, they match the trend of pastel colors this whole list has maintained. Each set contains four convenient, easy-to-clean mats that you can even cut down to the perfect size. Use it as a drawer liner too! Once placed, the mats will stay in place, but can be easily removed for cleaning or be use elsewhere. Not only does it look cleaner; it is cleaner! This may be the best companion for a cutting board ever seen. Just hang it on the cabinet or drawer below your workspace, put a produce bag, or even better, recycle a shopping bag, and voila, you have an easy way to catch the scraps as you chop, dice, and slice away! It fits cabinets and drawers up to 2 centimeters thick. The only downside is that it only comes in one color, but at least it’s a pretty shade of green. Want to get the kids to clean the microwave? This will have them cleaning it over and over! Just fill the volcano with water and place the lava back on top. Heat it in the microwave, and as the water becomes steam, it appears to be an eruption. The steam gets all the cooked-on residue less stuck and you can easily wipe it all away. Clean as new! The volcano comes in four color combinations too: blue/white, brown/orange, green/orange, purple/yellow. So, you’ve cut your onion, pressed your garlic, even skinned the fish and it’s all in the oven and smells incredible! Except for your hands. They reek of a combination of these odors, and you can’t make it stop no matter how hard you try. All you need is this rub-a-way bar made of stainless steel. Use it just as you would any regular bar of soap and you’ll be amazed at how fresh your hands will smell! Pop it in the dishwasher every once in a while, to keep it fresh, and it will last a lifetime, never needing replacement! It even will erase the scent of copper from pennies after you pay for your groceries you can now cook with and have no concern for the after odor. Staying healthy is so difficult in our society, and if you are on a special diet for some reason, getting accurate measures of how much we eat is essential. This food scale has a beautiful, sleek design, and the function to match its beauty. Put in a code and weigh the item to see the full nutrition information for that food. It has 2,000 common foods stored in it and room for you to add 99 more of your own! There is an app for both iOS and Android users containing all the codes and the company is devoted to great customer service. Moreover, a portion of the proceeds goes to the charity Global Orphan Project, so not only are you doing something good for yourself, but also for orphaned children around the world. If you have ever tried to open a pomegranate and consume its arils on your own, you understand the monster of an undertaking it can be if you don’t have a plan of action. Some people cut it in half and then work the seeds out in water, and since the flesh of a pomegranate floats, it’s not too hard to separate the edible from non-edible. But I’ve tried it, and this method takes a lot of time. But now, all you must do is cut the fruit in half, place a half flat side down, cover it up and tap the plastic dome of the aril remover with a spoon several times, open it up and you’ll see all the edible seeds in the bottom of the bowl and the remains of the fruit ready for composting separated on top in once big piece still. With the second half, just repeat and eat! Enjoy!